Thanks to the wonders of youtube, I finally got around to seeing the recent PBS/NOVA TV special, Cold Case JFK, which wasn't shown on UK terrestrial television. Although the website claims that the purpose of the show was to see if "modern forensic science" can "uncover new clues" about the assassination, it is obvious to anyone with more than two working brain cells that looking for "new clues" couldn't have been further from the minds of its producers and participants. Its true purpose was to rehabilitate the findings of the long-discredited Warren Commission by "proving" the Single Bullet Theory, and to dispel notions of a second shooter and, therefore, a conspiracy. In so doing, the producers of the show and its two ballistic experts, the father-and-son team of Luke and Mike Haag, cherry-picked and misrepresented the actual evidence in the case and shamelessly misled millions of viewers. A review of the facts fudged or ignored in Cold Case JFK demonstrates that the SBT is as impossible now as it was in 1964 when it was first proposed by Commission lawyer, Arlen Specter. And that the evidence of a second shooter remains as strong as ever. That's right, precisely as common sense would dictate, the bullet, travelling on a downward trajectory of 20 degrees, exited through the chest! This simple fact is, by itself, enough to invalidate the SBT. The makers of Cold Case JFK obviously knew this and so they moved the back wound inches above where it actually was in order to make an impossibility appear plausible. Thus their blatant dishonesty and their desire to validate the SBT at all costs was immediately revealed. Of the many objections raised to the SBT over the years, critics have had a hard time accepting that the bullet itself, dubbed Commission Exhibit 399, could have pierced seven layers of skin and flesh and smashed two bones only to appear in virtually pristine condition on a stretcher in Parkland Hospital. And it hasn't just been Joe public who has found the notion difficult to swallow. For example, famous pathologists Dr. Milton Helpern and Dr. Cyril Wecht both strongly objected to the Warren Commission's premise. In his 1979 testimony before the House Select Committee on Assassinations, Dr. Wecht remarked that he had repeatedly urged his colleagues in forensic pathology to come up with one bullet that had done what it was alleged CE399 had done and remained in such remarkable condition. "...at no time", he said, "did any of my colleagues ever bring in a bullet from a documented case...and say here is a bullet...it broke two bones in some human being, and look at it, its condition, it is pristine." (1HSCA337) More than 30 years after Dr. Wecht's testimony, we are still waiting for a similar example to be produced by defenders of the SBT. For Cold Case JFK, Luke and Mike Haag pretended to address this issue by firing a Carcano bullet into pine boards. What they found is exactly what the late Dr. John Nichols reported decades ago; Carcano rounds are capable of penetrating three feet of pine whilst remaining in a near-pristine state. Which is all very interesting. But it doesn't address the real issue: What happens to Carcano bullets that penetrate flesh and bone? Thankfully, tests performed for the Warren Commission at Edgewood Arsenal have already answered this question for us. Who's he trying to kid? For his 1985 book, Reasonable Doubt, author Henry Hurt performed his own tests. As he wrote, "Firing these bullets into water consistently produced nearly pristine slugs, strikingly similar to the Magic Bullet." 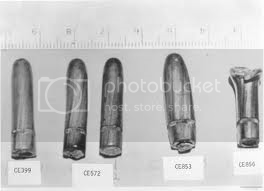 (Hurt, p. 385) In actual fact, the test bullet pictured in Hurt's book looks almost exactly like CE399, slightly flattened base-end and all. So how the hell could CE399 do all that damage and emerge looking just like a bullet that had been fired into water? This is an important question that supporters of the official fairy tale have struggled for decades to adequately address. But according to the Haag team, the answer lies in the supposed fact that the bullet was "yawing" or "tumbling" when it struck Governor Connally. This is actually not an original claim, it's as old as the SBT itself. And just like the SBT, it's based on little more than the desire of its proponents to believe it's true. 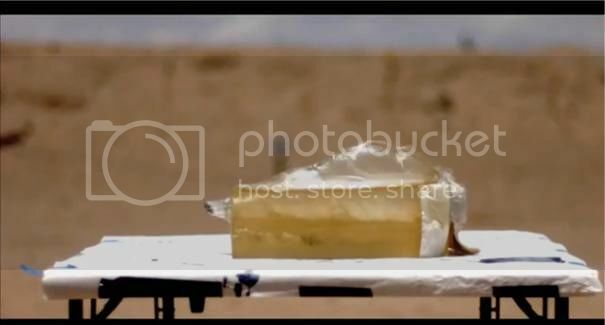 To demonstrate their point, the Haag team fired Carcano rounds through blocks of ballistic soap and gelatin, presumably meant to simulate JFK's neck. Leaving a gap of three feet—which they claim is the distance from JFK's throat to Connally's back—they placed a "witness panel" made of sheet rock at the exit end of each block. According to the show's narrator, "The witness panel records the bullet's orientation after exiting Kennedy's neck." A close-up of the mark left on the panel by one of the test bullets shows a complete profile, demonstrating that the bullet was flying sideways when it struck. Haag then informed viewers that "Connally's coat has this kind of a hole in it". "And", the narrator added, "so does Connally's back, according to his surgeon." This is pretty much what I expected they would say and yet somehow I was still disappointed by the dishonesty. The average viewer would take it for granted that what NOVA was telling them was accurate. But it wasn't. It was a blatant misrepresentation. SPECTER: Will you describe Governor Connally's condition, Dr. Shaw, directing your attention first to the wound on his back? So, according to Dr. Shaw, the entrance wound was only 1.5 cm long, which is half the length of the bullet and half the length of the mark left on the witness panel. The holes in the Governor's coat and shirt were approximately the same length, measuring 1.7 and 1.3 cm respectively. (7HSCA138-41) Clearly, then, the bullet was not flying sideways when it struck Governor Connally. I'm sure that the Haag team would still argue that the roughly elliptical nature of the wound was still evidence of a tumbling bullet. 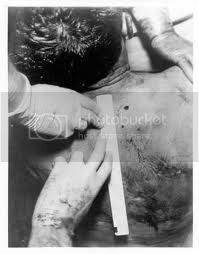 But then they're going to have to explain why the entrance wound in the back of President Kennedy's head also measured 1.5 cm (ARRB MD3). Was that also tumbling? If so, why? Their own tests demonstrated how stable Carcano rounds were before striking a surface. So what had that bullet struck before it reached JFK 's head that caused it to yaw? In truth, we don't need the Haag's to answer these questions. 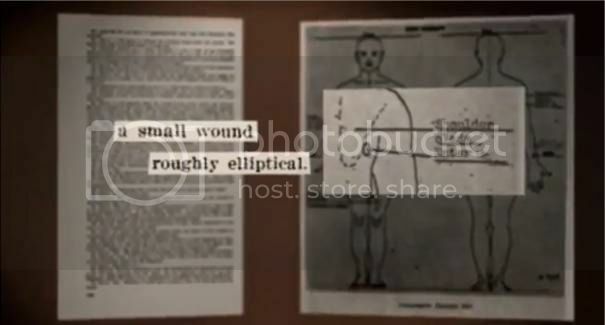 Because, as Dr. Shaw explained in his testimony, an entrance wound is often elliptical when it "enters at a right angle or at a tangent. If it enters at a tangent there will be some length to the wound of entrance." (6H95) So, whatever the Haag team or any other Warren Commission apologist wants you to believe, there is no good reason to conclude that the bullet was tumbling when it hit Connally. But NOVA dropped in another fact that they wanted viewers to believe supports their contention that the Connally bullet had already struck Kennedy: the lack of "bullet wipe" around the entrance hole in Connally's jacket. 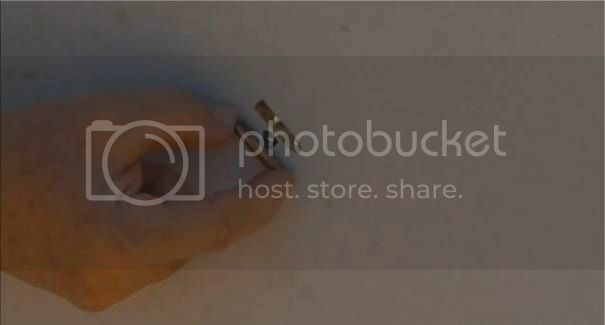 As Haag described it, "bullet wipe" is the "smudgy material on the surface of a bullet that literally wipes off as it pushes through the first surface it encounters." By bringing up the lack of bullet wipe on Connally's jacket, Nova makes the implication that it couldn't have been the first surface the bullet touched. Honestly, even after they moved the back wound up into the neck, I still couldn't believe that NOVA tried to get away with this one. The truth is that whether JFK and Connally were struck by the same bullet or not, no bullet wipe would have been found on the Governor's jacket. Why? Because before it went to the FBI for examination, Connally's wife sent his clothing to the cleaners! In fact, FBI Agent Robert Frazier testified that because of the cleaning, he couldn't even state for certain that the hole was made by a bullet. (5H63) It is my belief that if NOVA knew enough to know that there was no bullet wipe on the jacket, then they had to know that it had been cleaned before examination took place. So once again they deliberately tried to hoodwink their viewers. And it wasn't just the already established facts that NOVA and the Haag's misrepresented to make their case, but also the results of their own experiments. "In test after test", the narrator opined, the Carcano bullet moves straight through tissue simulant, but tumbles when it re-enters the air." Luke Haag added, "That was a real surprise. I can't explain it..." The impression they tried to create was that the bullets stayed straight and true until, in Haag's words, they were "back out into the atmosphere". The reason he can't explain it, is because it's not true. Just a few minutes before making those claims, NOVA showed the path a bullet took through a block of soap. 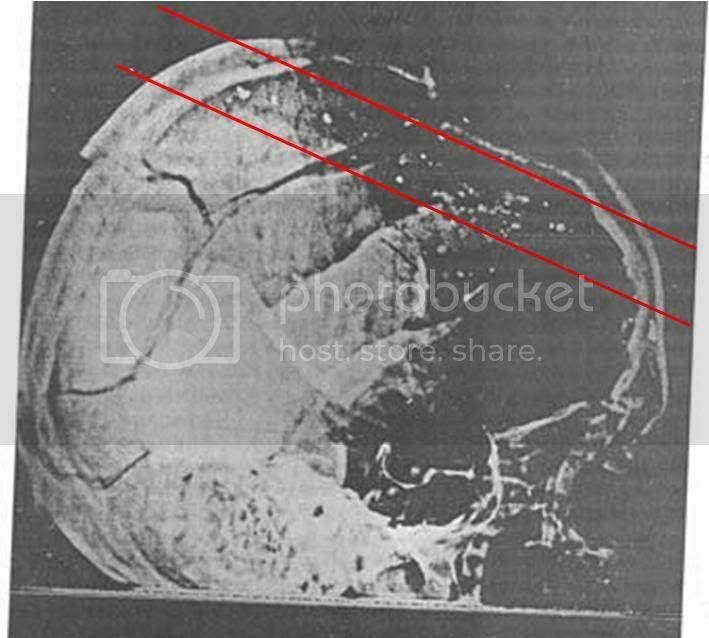 Obviously this looks nothing like the wound described by the Dallas doctors so NOVA knew they couldn't get away with saying that the bullet was tumbling as it left JFK's throat. Instead they pretended that the bullets in their tests didn't start tumbling until they re-entered the air even though they had already demonstrated otherwise! Amazing the lengths these people will go to defend the indefensible, isn't it? Having demonstrated to Luke Haag's satisfaction that "the Single Bullet Theory as proposed by Arlen Specter is the correct one" (yawn, what a surprise), NOVA turned its attention to President Kennedy's head wound. Everybody knows that the Zapruder film shows JFK being slammed backwards and leftwards by the shot that exploded his skull. And most people agree that this is consistent with a shot fired from the right front, i.e. the area of the Grassy Knoll. This is, of course, supported by the fact that dozens of Dealey Plaza witnesses believed a shot or shots were coming from that very area. But NOVA cannot allow this to stand because it doesn't fit their lone gunman scenario. So they presented Professor Michael Hargather to propound on the difficulty of locating the source of gunshot sounds in urban environments. "Multiples buildings, multiple locations that the shockwaves reverberate off of", he said, "Can give us multiple sound signatures." NOVA claimed that with each gunshot, "an observer can hear two sounds; the crack of the bullet passing, followed by the blast of the gun that fired it." So, as Hargather summed it up, "In a complicated geometry like Dealey Plaza in Dallas, you could get multiple shock reflections in that geometry. And so someone could hear multiple sounds from a single shot." Intriguing stuff. But how does that explain why so many witnesses pointed to two fairly specific locations, the book depository and the knoll, as the source of shots? And if what they were hearing was multiple sounds from each shot reflecting off of buildings, shouldn't the witnesses have reported hearing many more shots than they did? Regardless, NOVA had once again fooled its viewers. This time into believing that all there was to it was some confusion among witnesses about what they heard. Not once did NOVA mention that a good number of witnesses—including S.M. Holland, Austin Miller, and Thomas Murphy—actually reported seeing puffs of smoke coming from behind the picket fence atop the knoll during the shooting. It has been claimed by Warren Commission apologists that modern ammunition is "smokeless" and therefore, whatever these witnesses saw, it couldn't have been gunsmoke from a Grassy Knoll assassin. But this is not true according to the firearms experts for the HSCA who said that "it would be possible for witnesses to have seen smoke if a gun had been fired from that area" because "both 'smokeless' and smoke producing ammunition may leave a trace of smoke that would be visible to the eye in sunlight. That is because even with smokeless ammunition, when the weapon is fired, nitrocellulose bases in the powder which are impregnated with nitroglycerin may give off smoke, albeit less smoke than black or smoke-producing ammunition. 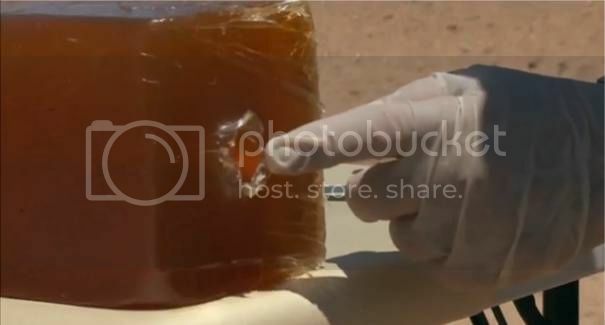 In addition, residue remaining in the weapon from previous firings, as well as cleaning solution which might have been used on the weapon, could cause even more smoke to be discharged in subsequent firings of the weapon. 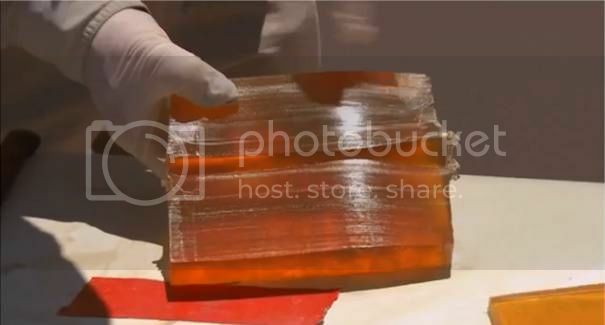 "(12HSCA24-5) But you don't need to take these experts at their word, you can watch for yourself videos like this one on youtube showing considerable amounts of smoke from a single rifle shot. Equally observable on this X-ray is a track of "missile dust" through the skull that Cummings and NOVA made only passing reference to. We shall return to this point shortly. NOVA dealt with this seeming discrepancy by asserting simply that the bullet did not follow a straight-line trajectory. 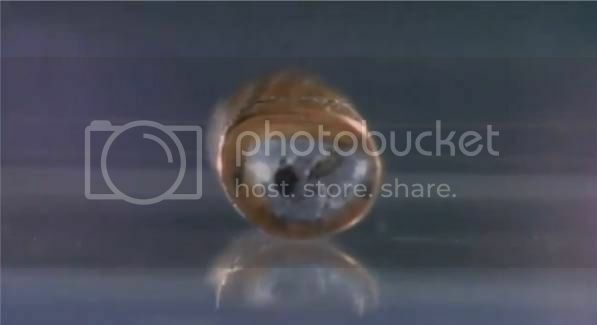 The show featured wounds ballistics expert, Larry Sturdivan, who explained to viewers that the skull bone "is hard enough and strong enough and dense enough to deform the bullet. When it destabilises it begins to yaw. As soon as it begins to yaw it develops a lift force, like an aeroplane wing, and it will inevitably take a curved path." In simpler terms, the bullet was deflected. In support of this contention, NOVA claimed that when Carcano rounds were fired through skulls at the "Bio-physics laboratory" they "did not follow a straight path inside the skull". They offered no proof of this claim but I am willing to give them the benefit of the doubt since bullet deflection is hardly their invention. In any case, this brings us onto an important point about how NOVA used data selectively to support one scenario whilst ignoring that same data to discount another. 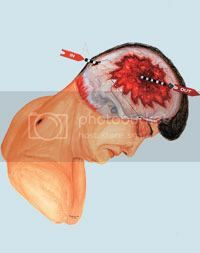 Because, having admitted that bullets are easily deflected upon striking the skull, NOVA dismisses the possibility of a shot from the right front by stating that "a shot from the Grassy Knoll would have exited through the left side of Kennedy's brain, but that is largely undamaged." Of course, based on the information NOVA itself supplied, there is no reason to believe this conclusion. But more important than any of this is the location of the fragments on JFK's X-rays. The red lines added to the above X-ray show the approximate axis of metallic debris. What should be immediately obvious to those paying attention is that the path laid out by these fragments is in no way related to the entrance wound in the back of the skull. 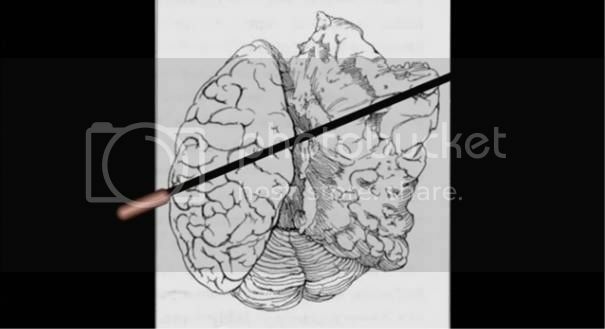 As Dr. Joseph N. Riley has pointed out, the fragments in the brain and the damage to the cerebral cortex cannot be due to the shot described by the autopsy surgeons because the wounds are discontinuous. Dr. Riley, who has a Ph.D in neuroscience and specializes in neuroanatomy and experimental neuropathology, says that the damage to the brain could only be the result of two separate bullet strikes. 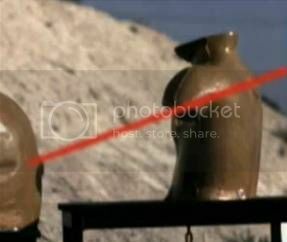 (see here) That this second shot to the head (more likely the first to actually strike) was travelling from front to back is indicated by the distribution of the fragments. When a bullet disintergrates on striking a skull, the smaller, dust-like fragments are found closer to the entry point and the larger particles are found closer to the exit. This is because the larger fragments, having greater mass, have greater momentum and are carried further away from the point of entry. This is precisely what is seen in the X-ray above, with the smaller particles located at the right temple and the larger ones towards the top back part of the skull. Little wonder, then, that NOVA chose not to go into detail about these bullet "pieces in the brain". "The tissue inside the skull was being moved around. It caused a massive amount of nerve stimulation to go down his spine. Every nerve in his body was stimulated. Now, since the back muscles are stronger than the abdominal muscles, that meant that Kennedy arched dramatically backwards." And with that, the last of NOVA's bold claims is revealed for the sophistry it is. This wasn't a fun piece to write. It was relatively easy, because there was really nothing new in the show, but it wasn't fun. Having to wade through this type of crap, all these half-truths and misrepresentations, as well as the god-awful pseudoscience, is more than a little tiring. Frankly, it's depressing. Over the last five decades, we have learned a lot about the assassination of JFK. Concerned citizens have dedicated good portions of their lives to studying the evidence provided by the Warren Commission and ultimately found themselves disproving the Commission's conclusions. To find NOVA trying to undo all of that in an hour-long TV special is somewhat exasperating. Especially when one considers the fact that, with the money and resources at their disposal, NOVA could have easily contributed something meaningful to our understanding of the case. That they chose instead to perpetuate the cover-up is shameful. We are all judged by our deeds, and when the truth about the assassination is finally accepted, history will judge NOVA, the Haag's and Sturdivan accordingly. One point I neglected to address before was NOVA's claim that "Kennedy's shirt collar and tie show a bullet exited his throat". Hmmm. Do they really? Is the evidence as clear-cut here as NOVA makes it out to be? Let's see what FBI agent Robert Frazier had to say when he testified to the Warren Commission: "The hole in the front of the shirt does not have the round characteristic shape caused by a round bullet entering cloth. It is an irregular slit. It could have been caused by a round bullet, however, since the cloth could have torn in a long slitlike way as the bullet passed through it. But that is not specifically characteristic of a bullethole to the extent that you could say it was to the exclusion of being a piece of bone or some other type of projectile." (5H61) [my emphasis] And what about the tie? 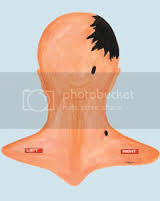 According to Frazier, the damage to the tie consists of a "nick on the left side...elongated horizontally, indicating a possible horizontal direction but it does not indicate that the projectile which caused it was exiting or entering at that point." (Ibid 62) Seems the evidence is a little more ambiguous than NOVA let on. DULLES: Where did it enter? CARRICO: At the time we did not know. CARRICO: The entrance. All we knew this was a small wound here. DULLES: I see. And you put your hand right above where your tie is? DULLES: A little bit to the left. Thanks, AK. There are some other points I forgot to address so I may be adding to this shortly. "To find NOVA trying to undo all of that in an hour-long TV special is somewhat exasperating. Especially when one considers the fact that, with the money and resources at their disposal, NOVA could have easily contributed something meaningful to our understanding of the case. That they chose instead to perpetuate the cover-up is shameful. My sentiment exactly. After 50 years, I was hoping that some genuine integrity might come to the fore. I tire of the same ole crock. That NOVA would stoop to disseminating what is essentially political propaganda is indeed dismaying. If the content of Public Broadcasting System programs like NOVA (as well as Frontline) can be prostituted on behalf of the government and national security state in the matter of the assassination of President Kennedy, then their credibility on every subject presented in NOVA programs becomes suspect. Can we trust what NOVA presents any more concerning climate change and global warming, for instance, or about the efficacy and safety of drugs and vaccines? We are truly living in an Orwellian state out of the novel 1984. Rather than an impartial examination of evidence and "theories" that have been put forward to explain and interpret the historic events surrounding the assassination, and subsequent and so-convenient assassination of the alleged assassin two days later, NOVA tried to prop up only one bogus "theory" (really the official government cover story) that was broadcast to the public the day and weekend of the events with little elaboration except for the ludicrous "single-bullet" hypothesis which the Warren Commission staff had to concoct to make the government's "three shots and three shots only" claim appear to hold up at all. The scientific method has some relevance to investigation of murder cases and historic events, although the items under investigation are human, rather than non-human, physical objects and forces. Issues like psychological motivation and individuals' social interactions and connections play a significant role in understanding and solving murder cases that don't generally play any role in most any other scientific inquiry, or theory-testing. Although I am not a scientist by vocation myself, I am aware that Science does not actually involve "proving" theories so much as it is about falsifying or disproving prospective theories. The official narrative has been thoroughly discredited and essentially disproven, scientifically-speaking, decades ago. It merits no more serious discussion and analysis. The NOVA program brought no new scientific insight into the case, or even new technology, except for the laser-based surveying equipment which had negligible relevance to settling any issue about conflicting evidence in the case. Oliver Stone's film JFK or the banned British documentary series, The Men Who Killed Kennedy, examine the evidence and draw conclusions that strike far closer to the truth of the matter than anything the public has received from our extremely corrupt mainstream media.